During the cold winter months, homeowners require special equipment and supplies to protect their premises and their most valuable assets. This time of the year calls for convenient solutions allowing you to melt ice accumulations and keep your outdoors clean and safe around the clock. The mini grit bin that we provide supports your annual snow removal efforts and is ideal for your driveway, patio, path or garden. What Is the Purpose of the Mini Grit Bin? 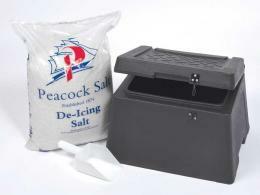 With the mini grit bin by your side, icy roads are no longer a problem. This chic and incredibly practical grit storage box is ideal for domestic use and comes with 10 kg of rock salt, as well as a small injection moulded scoop. Due to its practical and appealing design, this product can be used and stored in different parts of your property, including your patio, parking spaces or driveway. 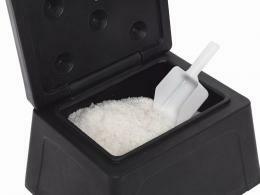 Neat and small, our grit bins with salt are a great pick for tiny spaces. Given its multifaceted design and elevated practical value, the model of bin that we stock and sell can be used as a stylish storage box suitable for outdoor applications, when not holding grit. Its hinged lid keeps the water out at all times, enabling users to shelter their contents from water damage. The waterproof material and its sturdy construction are two key advantages that turn the mini grit bin into a bestselling item. The mini grit bin stocked and sold by The Workplace Depot is the best choice for homeowners who wish to grit their outdoors, including patio, paths, gardens and driveways with ease, year after year. Made of medium density recycled polyethylene, this container is durable and is a reliable candidate for outside storage. Very sturdy and resistant, the bins that we deliver can be left outside season after season without showing signs of discoloration or cracks. Its versatile design makes it suitable for several other household applications, such as logs and coal storage, garden tools storage or children’s toys storage. its standard dimensions-(475(H) x 383(W) x 305(D) (mm)-, black colour and versatile design turn the grit bin that we provide into a smart storage solution with great potential, which can be deposited and handled onsite with ease. The empty container weighs only 5 kilograms, can hold up to 30 litres and is extremely easy to move around. Order yours today and benefit from free delivery and a 1-year warranty on labour and parts.